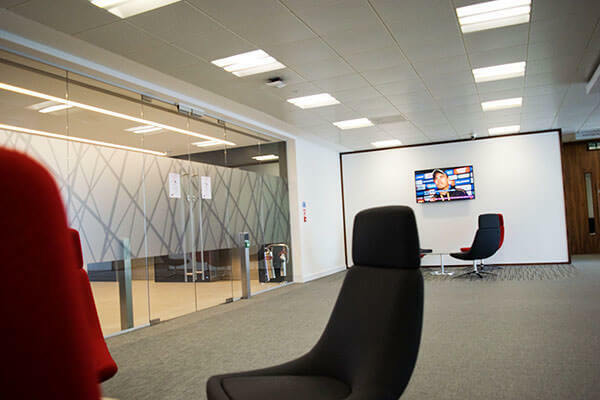 In the spring of 2014 a global engineering, project management and construction company undertook a venture to relocate their UK head offices to a new site in North West London. Cinos were invited to provide an in-depth proposal for the transfer of the audio visual estate from the existing head office to the new location. Working with the client, existing systems were audited to get an accurate picture of their technology and a clear understanding of business needs and future requirements. Once these were ascertained, Cinos were able to advise where a technology refresh was required, and current systems that could be relocated to the new head office. 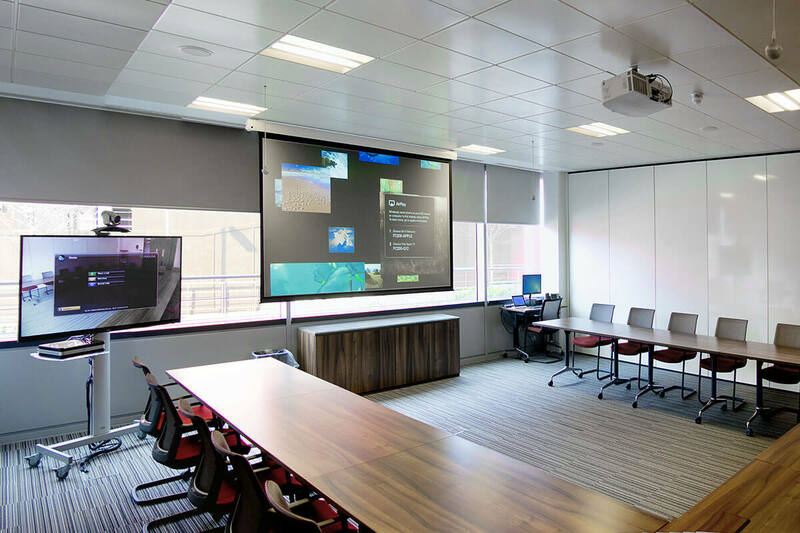 By working closely with the IS&T department we have been able to integrate a range of audio visual and control technologies. These technologies better suit our clients’ new working practices and maximises the flexibility of their meeting spaces. ‘Ease of use’ was the principal consideration for the relocation project. Whilst the latest technologies were utilised to meet the bespoke requirements, it was of paramount importance that the user can walk into any one of the rooms and intuitively operate the system. The new offices consist of nine meeting rooms, a management boardroom and three multifunctional, divisible meeting rooms. 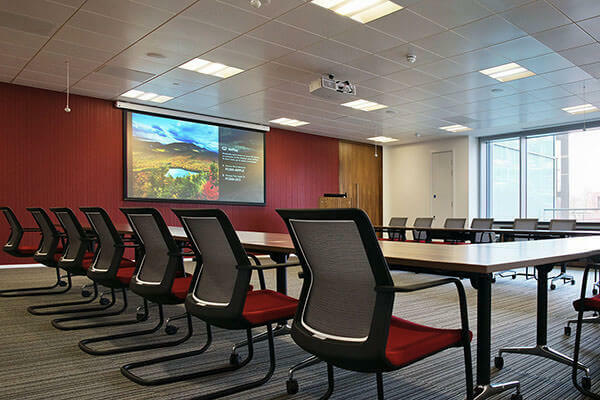 Designed for presentations and collaborative purposes these areas utilise a range of audio visual technologies. The divisible meeting rooms are designed to cater for larger collaborative sessions. Each of these rooms act independently but when required, open up into a larger meeting space, with each of the room systems acting as one coherent solution. Video conferencing was a key requirement for the new head office. Whilst areas such as the management boardroom contain dedicated systems, it was necessary to provide mobile units to enable any room to host a video conference. With a number of meeting spaces available it is important these areas are managed effectively to avoid double bookings and interrupted meetings. A room booking system was required to enable the booking of meeting rooms from outside of the room and via integration with third party software. When relocating offices, display technology is always a key consideration. After working with the client to understand the layout and specific requirements of the new office, Cinos deployed a range of display solutions from NEC. All meeting areas within the office contain the NEC E Series range. These commercial grade displays utilise LED backlighting to provide a thinner, sleeker display; ideal for presentations and cross-company collaboration. Naturally in the communal area the displays are active for longer periods of time and so the V series from NEC are in place for their extended use and high performance design. 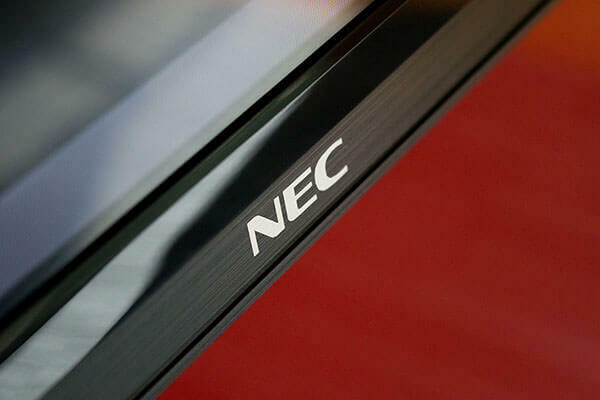 In addition to all the technical features, NEC displays provide further environmental advantages. An integrated backlight adjust setting allows employees to customise the backlight strength, enabling a longer display life and lower power consumption. An energy saving picture mode is also built into the on-screen menu to improve energy efficiency along with using scheduled power on/off functions to ensure displays are only powered up when the offices are occupied. form factor Amino Set Top Box (STB) installed behind each display. In addition, the NVOD (Near Video on Demand) application from Tripleplay allows company presentations to be played on a continuous loop across four television channels. This is ideal for reception and greeting areas where visitors can quickly gain a decent overview of the company and its operations. further reducing the need to incorporate legacy VGA technology. With a range of technology in place across the office, simple and intuitive control is of paramount importance. The AMX Modero S Series Touch Panels offer exactly this. Their simple to use, gesture-based interface and advanced features enable employees to conduct meetings simply and effectively. In addition, through providing a consistent, client-branded design, Cinos has ensured that the familiarity of the touch panel system is retained, whilst it manages the bespoke requirements of each area. The Evoko Room Manager was chosen to avoid scenarios such as double bookings or interrupted meetings. Employees can check room availability and reserve meeting spaces from the 8” touch-sensitive screen located outside each room. Integration with the corporate email system provides further functionality; allowing employees to book meeting rooms from their desks via their computer, tablet or smartphone. The system also allows for an administrator to export usage statistics for each meeting space, showing how effectively the meeting spaces are being used and highlighting any usage trends such as participant numbers or specific technology requirements. In such a large office numerous meetings are an inevitable reality, and so it is important to have sufficient resource in place to meet these demanding requirements. Working with the client, Cinos designed and installed audio visual solutions that would provide each of the nine rooms with presentation and collaborative capabilities. 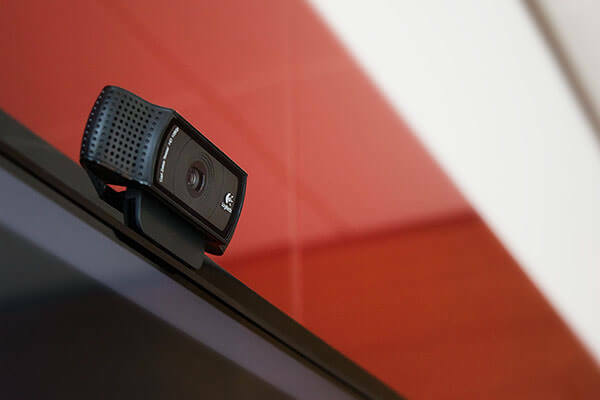 the Logitech C920 HD webcam used in conjunction with a Philips Bluetooth conferencing speaker and microphone. 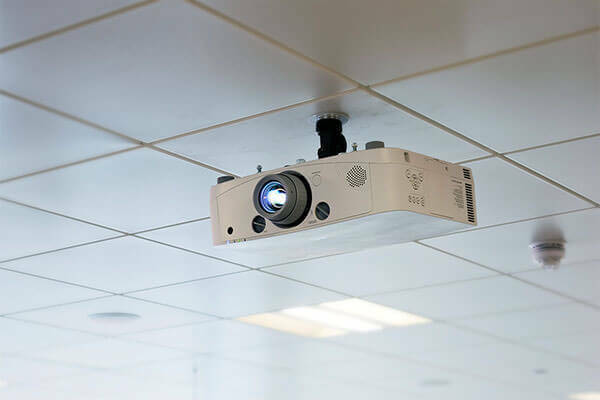 For the more demanding video conferencing requirements, one of three mobile conferencing systems can easily be moved into the room and integrated into the room system via an HDMI floor box connection. place on the mobile display, with content sharing and collaborative capabilities utilised on the room display. The AMX NI-700 NetLinx® Integrated Controller is used to meet the specific control and automation needs of each room. Ideal for single room environments the NI-700 enables employees to switch between various room sources such as ClickShare, TripleTV, the room PC and Polycom’s video conferencing. Users can select any of these sources via the AMX MST-701 7” Modero S Series Tabletop Touch Panel. 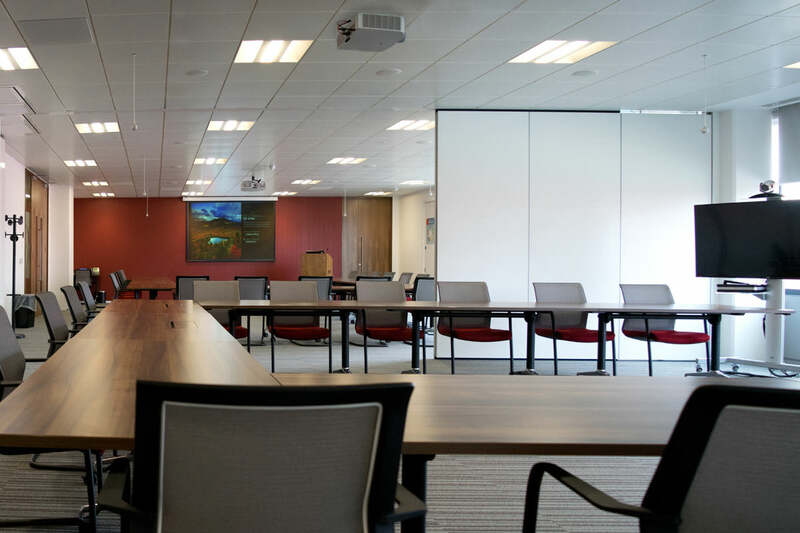 Designed as a true, multi-functional meeting space, these rooms utilise moveable partition walls to deliver a range of room formats for specific business requirements. In single room mode meeting participants can enjoy videos, share content or access TV channels on an 106” electronic projection screen, courtesy of the NEC 5000-lumen projector. 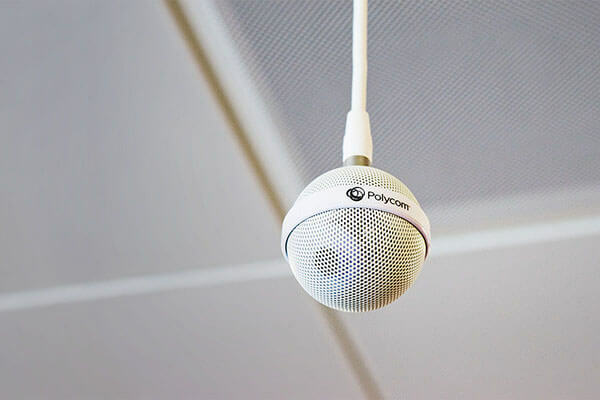 All audio requirements have been catered for thanks to the integrated Polycom SoundStructure C16 solution. At the touch of a button employees can join an audio conference or make a SIP or analogue call. Each room contains ceiling and lectern microphones, as well as ceiling speakers to provide consistent, high quality audio throughout the area. Barco ClickShare allows employees to share presentation content wirelessly in each room scenario. Additional content sharing capabilities is provided for employees with iPhones or iPads. By selecting Apple TV from the room touch panel, employees can instantly share their content without the worry of installing additional software or connecting cables. To ensure the seamless transition between the various scenarios the AMX Enova DVX-3150HD sits at the heart of each room system. This all in one presentation switcher, amplifier, controller and video scaler provides control of the rooms audio visual systems via the AMX Touch Panel user interface. The Enova DVX and touch panels are programmed to adapt accordingly to each room scenario. For larger sessions the partition walls can be removed to create either a dual or triple room meeting space. In dual or triple mode the remaining touch panels are programmed to power down so that all sources can be controlled via the central presentation touch panel. Here the central Enova DVX will control all inputs with the ability to push these to any output across each area. In single room mode, video conferencing from Polycom is available in the main meeting room, as well as in in an ‘all rooms’ presentation scenario. 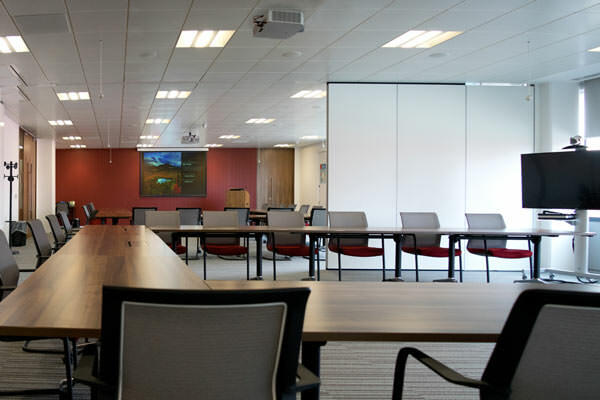 In this situation the mobile conferencing units are connected to floor ports in the secondary rooms, acting as repeater displays whilst the master boardroom hosts the main video conferencing call. Senior management can take advantage of collaborative and presentation functionality in the office’s management boardroom. Full audio and video conferencing capabilities are available thanks to Polycom’s HDX 7000 and C12 SoundStructure solutions. At the touch of a button employees can initiate a video or audio conference, or easily make a SIP or analogue telephone call. Sitting at the heart of the room system is the AMX Enova DVX-3150HD for control and switching of the Barco ClickShare solution, IPTV, room PC, video conferencing and employee laptops. Using the AMX MST-1001 Touch Panel solution, users can show any of these sources on the two commercial grade 55” E554 NEC displays for group presentations and cross-company collaboration. Cinos have ensured that both the technology and user interfaces across the new office remain consistent. The AMX Modero S Series Touch Panels are in place across all meeting areas. Each panel has the same client-branded user interface; ensuring whatever room an employee walks into, they can operate the system with ease. 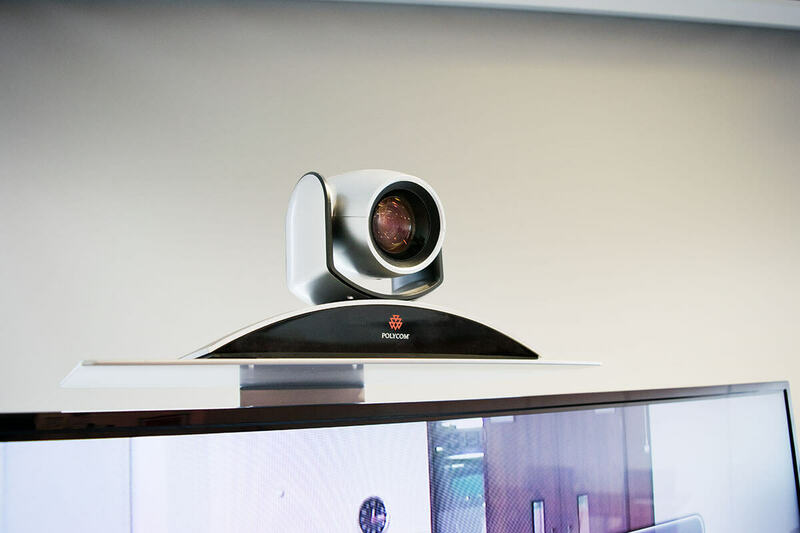 The same video conferencing solution from Polycom is used for the mobile conferencing units, master divisible meeting room and management boardroom. 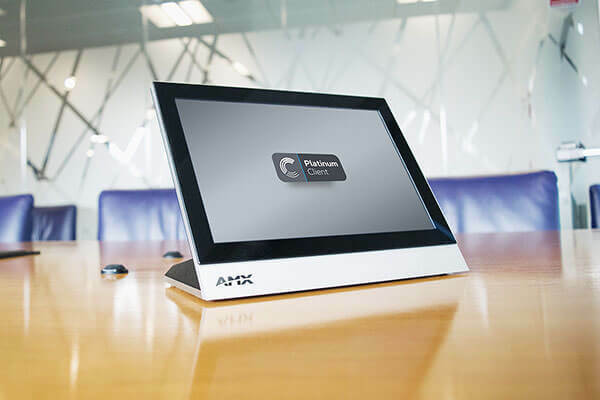 This consistency ensures that once employees have been trained on the Polycom HDX 7000 system, they will be able to operate it regardless of its location in the office. The Room Booking Manager from Evoko allows employees to check room availability and book meeting spaces via their PC, smartphone or tablet. This eliminates scenarios such as double bookings and interrupted meetings. With a consistent range of technology in place, the amount and variety of issues that could arise naturally diminishes. Not only does this allow Cinos to more effectively support the audio visual estate, it also reduces the amount of spares that need to be held, providing further cost benefits to the client. Cinos have specifically chosen market leading, professional grade products with a proven track record not only for their reliability but also in terms of the warranty packages available. If something was to go wrong, the warranties ensure a replacement product can be sourced quickly, minimising client disruption. 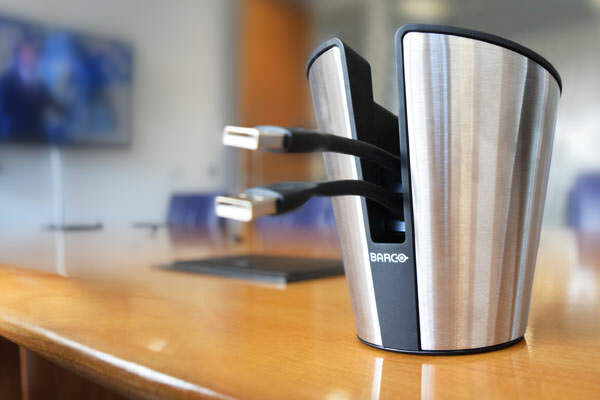 The ClickShare solution from Barco allows employees with ‘non HDMI’ laptops to connect and share content wirelessly; eliminating the need to incorporate legacy VGA technology. Whilst Tripleplay’s solution is currently used for the IPTV and VOD requirements, the infrastructure is in place to add digital signage services for when the client’s needs evolve. The AMX NI-700 and Enova DVX 3150 are in place to control the audio visual technologies in each area. The adoption of these technologies makes future expansion a much simpler process, whether that is adding more sources or providing extra control capabilities. 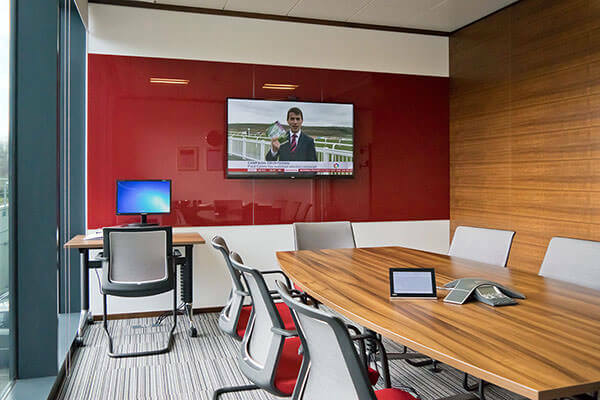 The use of the mobile conferencing units can transform any of the nine meeting rooms from a presentation area into full video conferencing environment for enhanced collaboration and improved decision making. The divisible meeting rooms can act as single presentation areas with full audio conferencing capabilities. 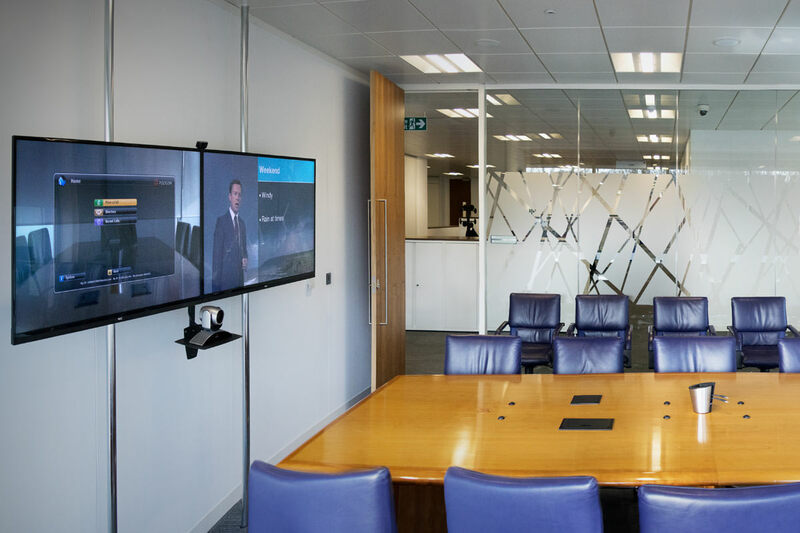 For larger multi-participant meetings the rooms can open up into a single area with full video conferencing and enhanced collaborative capabilities. 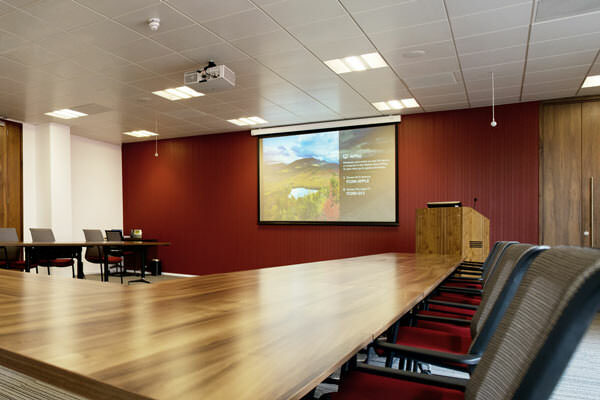 The Gold level maintenance and support agreement from Cinos allows the client to be confident that their audio visual and video conferencing systems will continue to run at peak efficiency. By having a trusted partner in this area the continued adoption of smarter working patterns is easily achieved. The office relocation project provided Cinos with a chance to truly understand our clients’ long-term objectives. As a result we have been able to deploy future-proof technologies which turn meeting rooms into multi-functional collaboration spaces. By ensuring these systems remain consistent across the site we have given familiarity for employees whilst minimising the amount and variety of issues that could arise. The Enova DVX-3150HD has been deployed in the management boardroom and each of the three divisible meeting rooms. This All-In-One Presentation Switcher provides control of all the audio visual technologies in in each area; replacing the need for numerous individual components and eliminating the integration and reliability challenges that accompany them. The NI-700 from AMX is geared to meet the specific control and automation needs of a single room environment. 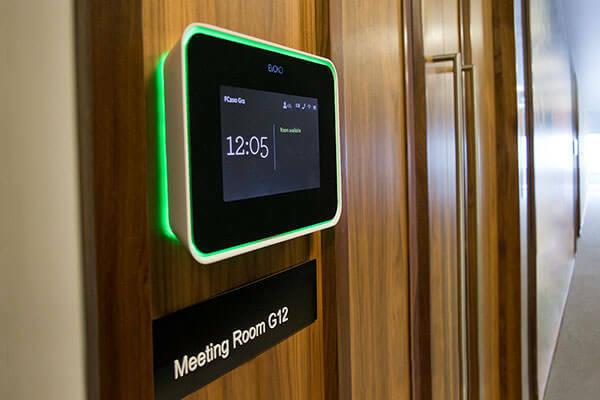 In each of the nine meeting rooms, the NI-700 acts as the interface between the touch panels and the room assets. It also allows for additional control capabilities to be added as the meeting room requirements evolve. 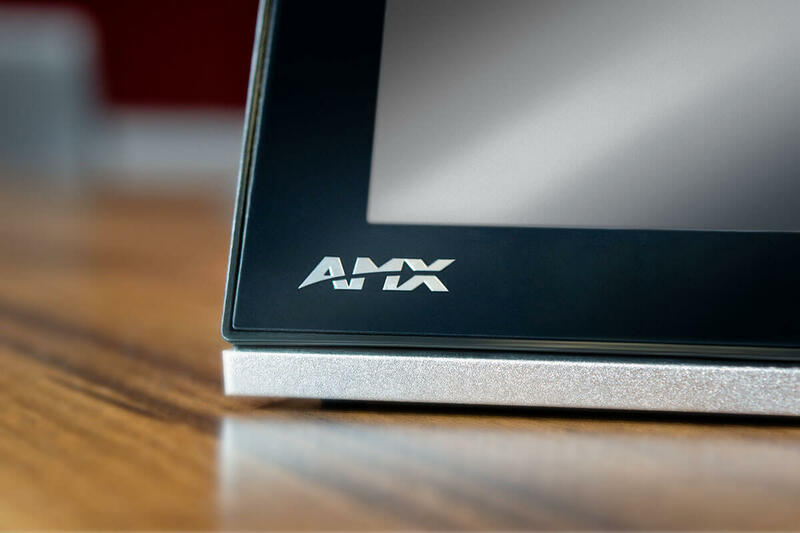 AMX Modero S series touch panels provide a consistent user interface in all meeting areas. Designed as a control surface to manage a wide variety of digital and analogue devices, this intuitive, easy to use solution is perfect for boardrooms and collaboration areas. Each touch panel boasts a client-branded design to ensure the familiarity of the system is retained whilst it manages the bespoke requirements of each area. Cinos have installed the 7” MST-701 Touch Panel in each of the nine meeting rooms and 10” MST-1001 Touch Panels in the each of the divisible meeting rooms and management boardroom.